Situated in the North of Italy near the border with France and Switzerland, The Saint-Vincent Casino (or Valley Casino) is part of a magnificent hotel complex developed around a building that dates back to 1947. A very popular holiday and leisure destination, the site now stretches over 3500square metres and offers fans of cash games a superb casino along with various entertainment amenities. 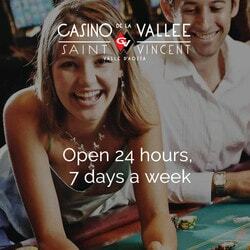 Covering several rooms in the hotel complex, the Saint-Vincent Casino offers players good quality services and quite a complete range of games. Its 400 different types of slot machines will appeal to lovers of slots. There is quite a diverse range of table games with all of the main classics: Roulette (French, English and American), Baccarat, Chemin de Fer, and Poker ( Carribean Poker and Texas Hold’Em). Other games such as Craps and Thirty-Forty are also available. Tournaments and other Poker competitions regularly take place in the casino. The Saint-Vincent Casino is a modern, future looking establishment . To this end it has opened its doors to virtual players thanks to the new technology from present day developers. In this case it’s the developer Authentic Gaming, which offers players in its partner casinos such as Lucky31 Casino and Dublinbet the opportunity to access the casino’s roulette tables and they can play different games live just as if they were actually present in the casino. On one’s PC one can soak up the atmosphere in real time and feel as if one is in the middle of the “real” players who can be seen during the games. Four roulette tables are filmed in real time and are accessible to online players: Authentic Roulette Double Wheel, Superior, Original and Professional. The Saint-Vincent Casino complex is made up of two superb hotels (The Park Hotel Billia and the Grand Hotel Billia), 4 restaurants and bars The Casino Brasserie, The Main View, the 1908 and Le Racsard), a SPA, three conference rooms as well as all the amenities necessary for spending a pleasant holiday in this magnificent Italian region. The Valley Casino is open 24/7. Entry is strictly open only to people over 18 years of age carrying ID. Suitable dress is also required to enter the casino.